Remember when you first realized that anime could grapple with real world issues and deep philosophical concepts while America spent its time resurrecting Tom and Jerry? Shigofumi, a bizarre little show overloaded with social commentary, was licensed by America after the third episode premiered in Japan. This unprecedentedly fast licensing led a lot of us to believe Shigofumi was going to be a cut above the rest. 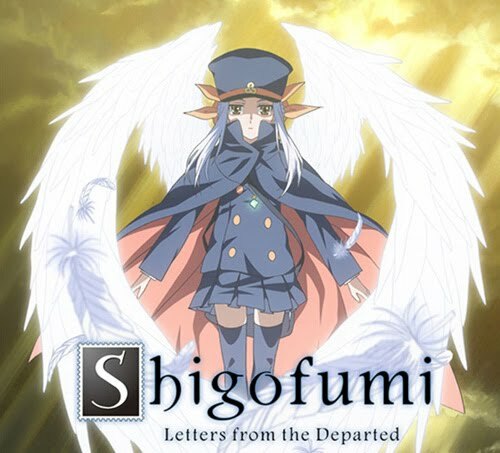 Shigofumi follows a deadpan, reserved girl named Fumi and her partner/multi-tool Kanaka (a talking staff) as they deliver "shigofumis," or letters from the dead, to their desired recipients. Did your mother commit suicide and want to tell you that it's not your fault? Send a shigofumi. A fun twist is that, while Fumi is technically dead, everybody in the real world can see her. Fumi's job has her travelling a lot, leaving the show's structure to seem disconnected and episodic. Yet as it progresses, Shigofumi slowly reveals the true mystery and connections between all the characters. In fact, the show almost surpasses itself in intrigue when one character recognizes Fumi during one of her missions, revealing a fact from her past that would compel even the most taciturn viewer to stay tuned. While Fumi's outfit is slightly reminiscent of Boogiepop Phamtom and the show features the abstract philosophies of Serial Experiments Lain, Shigofumi tackles issues such as high school harassment, suicide, school shootings and child abuse and presents them in a magnificently crafted new light. It is heavy-handed, but far easier to follow and thus, much more rewarding. Even with its daring approach, the humorous episodes of Shigofumi become uniquely heart-warming and sentimental while skipping back into traumatic black humor with the grace of a falling feather. This series is fearless in its portrayal of criminals, eccentrics, victims and bullies alike. In short, I cannot remember being this overwhelmed by the poignancy of an anime's message in recent history.